This post may contain affiliate links. Read my discolsure police here. 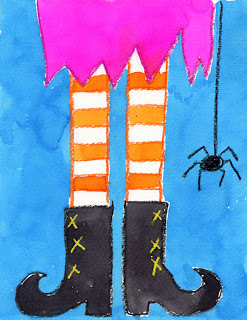 This Witch’s Feet Halloween Decor post may contain Affiliate Links. You can see my Disclosure here. Today I am participating in Cupcake Diaries 30 Days of Halloween Every day there will be a new Halloween project, recipe, idea, etc. I am excited to see all of the fun ideas! I am excited to share with you my first Halloween decoration that I have made for this year. So once I had the idea in my head I went shopping for a few supplies and then got crafting. 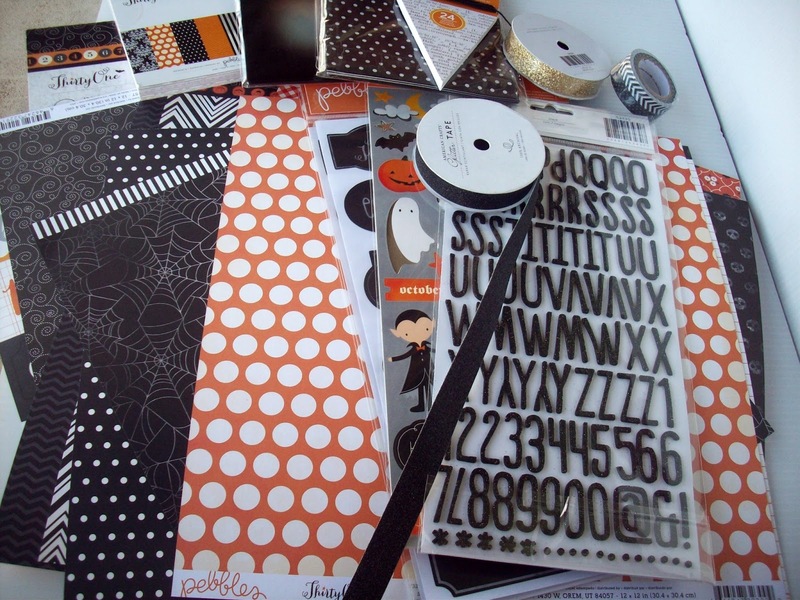 I recently received a fun package in the mail from American Crafts full of the latest Pebbles Thirty One Halloween line and I couldn’t wait to try it out. Everything is so cute and it is perfect for my project! First lets discuss the frame. There are a variety of 11×14 inch frames on Amazon – so if you want something really pretty look there. Or you can grab a frame from Dollar Tree, that is what I did. 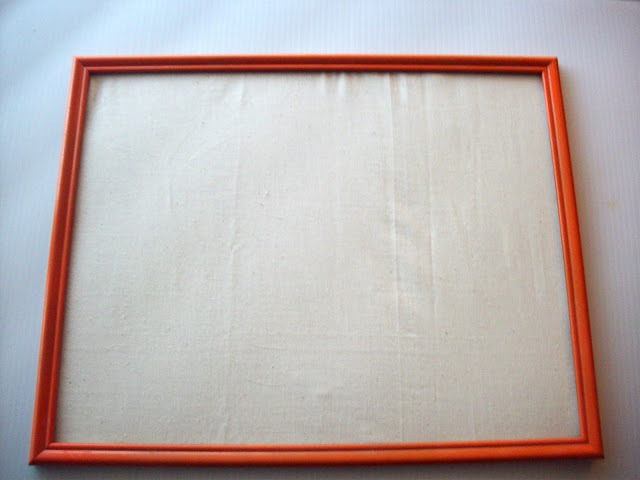 Remove the glass and backing from the frame and with your orange spray paint spray the frame orange. 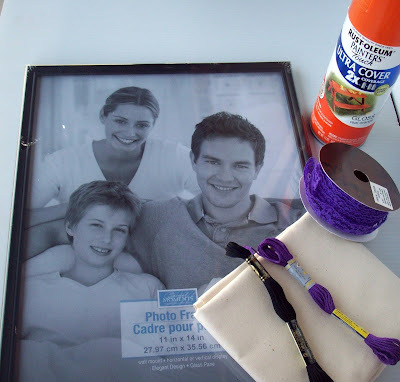 While the frame dries add your fabric to the backing piece. I used cream Muslin Fabric. Just cut the fabric to size with a little extra on each side and fold the extra fabric over the back and tape in place. You won’t need the glass so you can toss it or save it for a future project. Once the frame is dry put the backing back into the frame. Next we are going to cut all of our paper pieces out. I cut out the boots and spider in my Cricut Craft Room program. 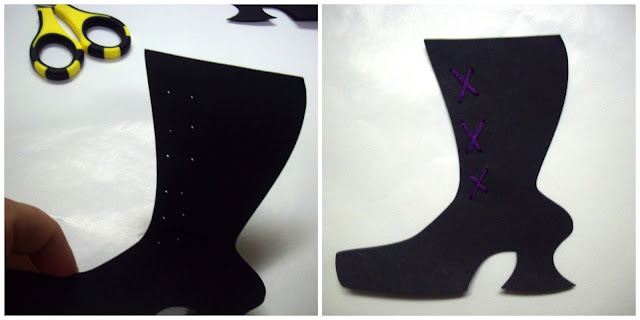 The boots are from the Cricut cartridge Groovy Times and I cut the boots to be 4 1/2″ tall and 4″ wide. The spider is from the Cricut cartridge Best images of 2010. I took the spider off of the hat image and made sure the actual spider was about 1 1/2″ x 1″. I then cut off the paper “string/web” as I was going to use real string for the project. The orange polka dot paper is for the legs – I actually changed it out very last minute to be solid orange legs because I felt everything was looking a bit too busy. These were cut to 2×5. 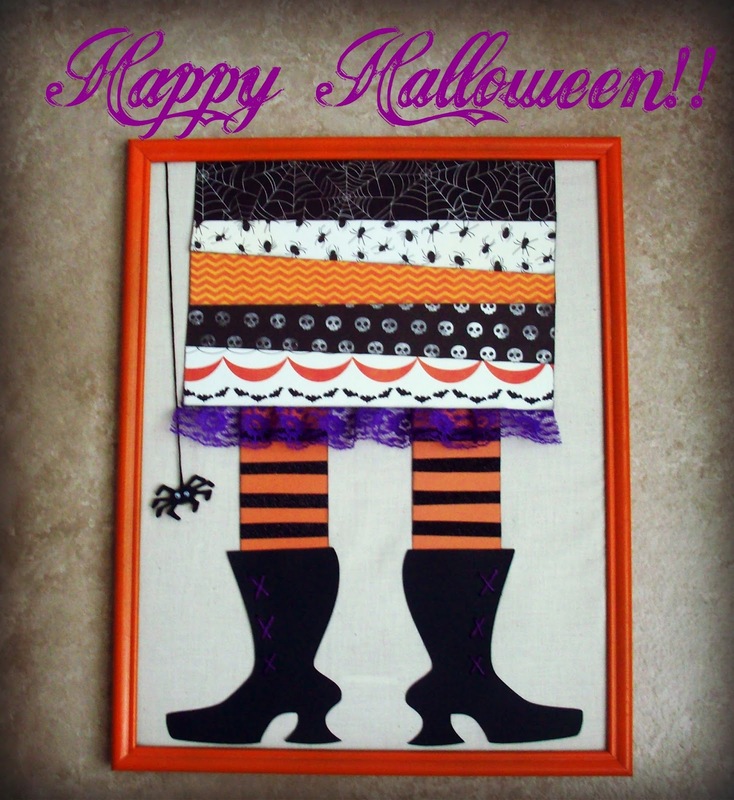 For the skirt I cut 5 pieces from the Thirty-One Halloween line. Each piece was 8 1/2″ long and 1 1/2 inches wide. The papers I used were Dreadful, Batty and Spider webs. I inked all the edges of the scrapbook pieces in black. I wanted to start putting this together from the bottom up because I knew it would be easy to adjust the skirt later if I had spacing issues. So I started with the boots. Using a sharp needle I poked a hole in the paper to mark the spots for the laces. I then threaded some purple embroidery floss on the needle and sewed the laces in place. I secured the floss on the back with tape. It was super easy! Now it was time to make the witch’s legs. I was going to use a orangepaper with white polka dots but felt everything was getting a bit busy so I traded it out with solid orange cardstock. I wanted to make it look like black and orange striped stockings and the American Crafts black glitter tape was perfect for this. I cut the glitter tape into 2 inch piece. Then each piece I cut in half length-wise and taped onto my orange legs. I then taped down the shoes and legs onto my fabric using orange tacky tape. This stuff is really tacky and the paper stuck to the fabric very nicely. You probably could use glue to stick everything to the fabric but I wanted to go with something easy. The skirt is where I get to show off some of the fun paper designs. I sure love these paper – so cute!! Using the orange tacky tape I put a piece along the back/bottom of my bottom piece. I then ran some purple lace along the tape. The tacky tape hold it nicely in place. I then arranged the rest of the pieces how I wanted them – Putting them at a bit of an angle and then ran some pieces of tape along the back to hold the paper in place. I then used my bigger roll of Tacky tape to tape the skirt onto the fabric. For the spider I glued on two googely eyes and attached some black embroidery floss to the back and wrapped the floss around the back of the board. I also used a glue “pop” dot to attach the spider to the fabric to make it pop off the fabric a bit. I like how the embellishments add some dimension to the project. Right now I have this hanging on my wall and I am currently working on a Halloween banner to put above it – I really love how this turned out! Check out more of my Halloween Crafts! Disclosure: I received product from American Crafts and Pebbles to create a craft project. All opinions are 100% mine. Did you enjoy this post? Then Subscribe today! Receive my simple crafts and delicious recipes to your email each week for free! 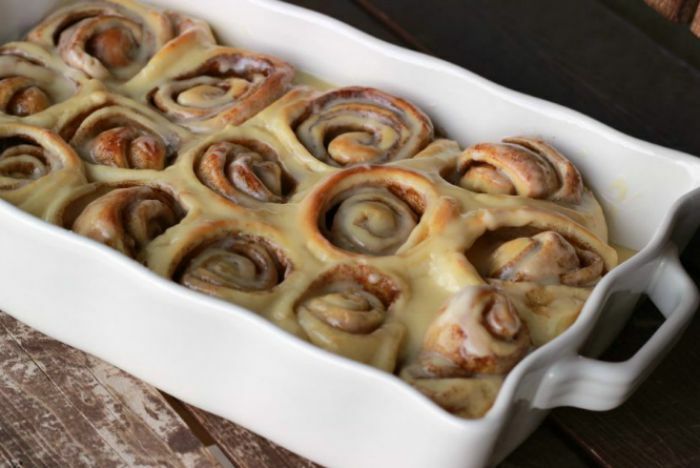 Get the latest delicious goodness straight to your inbox! Oh thanks so much Liz! You are so sweet! I love it! Good call on the legs being striped, they stand out more that way. Cute, cute paper!! Thanks so much Tia! I really loved the polka dot paper but it just looked so buy and I really wanted to use the black glitter tape. This is completely darling! I love it! SOO Cute! 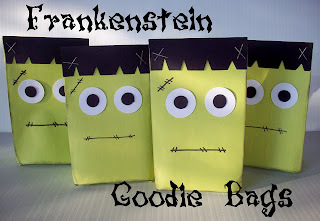 I also love the Frankenstein goodie bags! That’s way fun! I love the different designs! This is so stinkin’ CUTE, Summer! I love it! This is so clever and fun! Good job! That is one of the cutest things I have seen in a long time. Thanks for sharing how you made it. I look forward to your 30 days of Halloween and seeing what you come up with. Oh Summer that’s so cute! How totally cute! 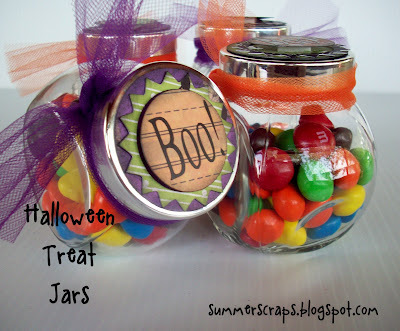 Great Halloween ideas! Wicked;) cute Witches Feet! Happily Pinning! Love this!! So stinkin’ cute! Super cute craft!!! I love Halloween!! 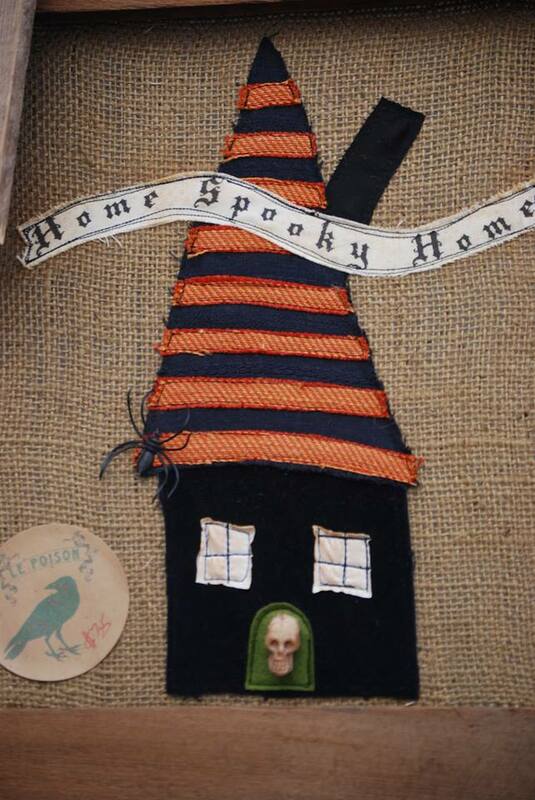 That is such an adorable craft and such an adorable Halloween decoration! I’m officially excited for Halloween now! SO cute! I love it! OMG summer…this is so stinking adorable. You are talented!! So “stinkin'” cute!Love the boots and stockings! Thanks for all of the wonderful comments! You all rock!! OH, my goodness. Your witch is adorable! 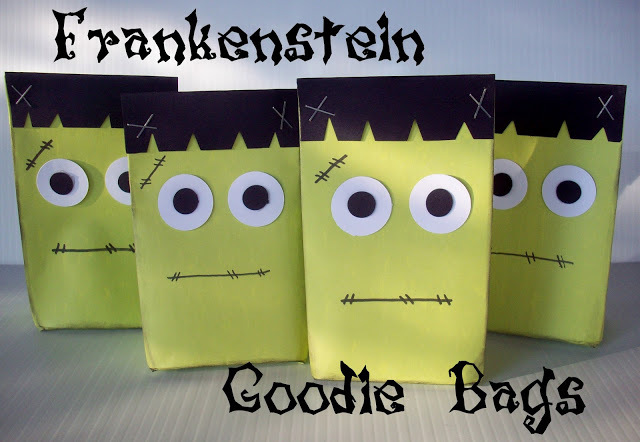 I want to make one!!! Summer this turned out so well. That witch is darling Summer! Seriously adorable! This turned out so fun! This is so dang charming! 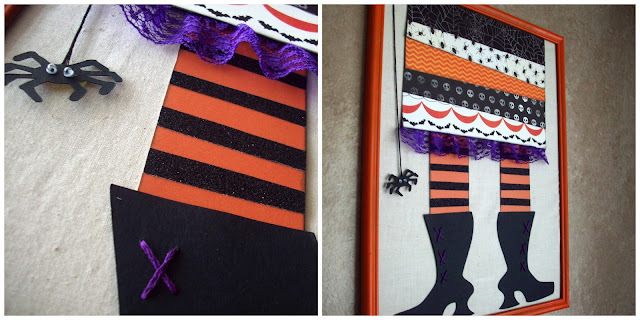 Love the witch’s feet and how you put it together with patterned paper! I will def have to attempt now! Thanks for sharing on Sunday FUNday! So happy you linked up! Hi I am Summer! Welcome to my blog. Food Crafts & Family is a blog sharing easy recipes, quick crafts and ideas for your family. Subscribe to Food Crafts and Family! 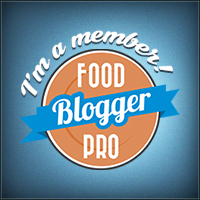 Receive my simple recipes and crafts directly to your email once a week for free! Summer Scraps, Summer Rumsey, is a participant in the Amazon Services LLC Associates Program, an affiliate advertising program designed to provide a means for sites to earn advertising fees by advertising and linking to Amazon.com.